Your facet joints are the pair of joints at every level of your spine and provide about 20% of the torsional (twisting) stability in the neck and low back. Facet joints are in almost constant motion and slide on each other with the surfaces coated by a very low friction, moist cartilage. A small sack or capsule surrounds each facet joint and provides the sticky lubricant for the joint called synovial fluid. Each sack has a rich supply of tiny nerve fibres that provide a warning when irritated. Past injury, poor posture or any abnormal loading of the facet joints due to the body having to adapt to bad habits or poor movement can result in a protective reflex arises when the facets are inflamed. This causes the nearby muscles to go into spasm. This process leads to the facets becoming particularly prone to wear-and-tear or degenerative disease over time, where the facet joints become prematurely worn and the cartilage becomes thin. The underlying bone can react producing bone spurs and an enlargement of the joints. These arthritic changes can produce considerable back or neck pain with movement. This condition may also be referred to as “facet joint disease” or “facet joint syndrome.” These are some of the most common of all the recurrent, disabling low back and neck problems, and can be very painful and disabling. However, facet joint problems rarely involve the spinal nerves. Although it is true that once the joint is worn it cannot be reversed, the pain often arises from a response from the surrounding tissues and not from the joint itself and this can be helped. Everyone will develop some facet joint wear as they get older but It does not necessarily mean that you are going to get pain from that joint. Research has shown that up to 65% of the population have degenerative changes but have no symptoms at all. It seems that pain levels rather depend on the sensitivity of the self-protective mechanism that the body uses by sending the back or neck muscles into spasm to better protect the arthritic joint. Unfortunately, this process can often become exaggerated, leading to a cycle of decreased function, decreased flexibility, and more pain. Although this is more common in an aging population it can happen in younger patients especially if there has been previous trauma or injury to the facet joints. Common symptoms appear as acute episodes of low back and neck pain that are intermittent, generally unpredictable, and occur a few times per month or per year. Low back pain from the facet joints often radiates down into the buttocks and down the back of the upper leg but rarely in the front of the leg or past the knee. Similarly, neck cervical facet joint pain may spread into the shoulders or upper back, but rarely radiate into the arm. 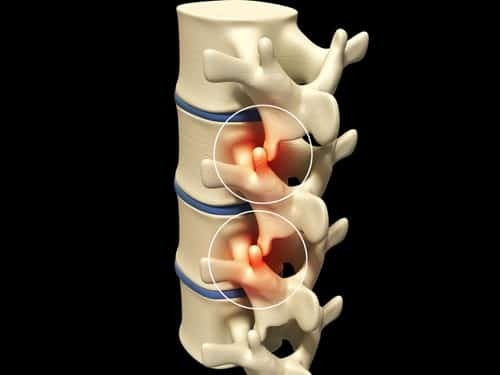 If the pain does radiate into the lower leg or lower arm, especially if associated with numbness or pins and needles it is more likely to be due to degenerative disc disease but often the two conditions occur simultaneously. Often the inflamed facet joints cause crooking and a postural change; over to the side or forward in the neck or back, along with powerful painful muscle guarding. When not inflamed, there will normally be tenderness over the joints and a loss of mobility. Typically, it is uncomfortable when bending backwards and less so with leaning forward. If you’re suffering from facet syndrome or arthritis symptoms, it’s important to receive a skilled assessment and diagnosis by an experienced osteopath. Although it is not possible to undo the wear on the facet joint it is entirely possible to relax the surrounding muscles to break the pain spasm pain cycle as well as changing the abnormal loading on the facet joint to reduce the sensitivity of the self-protective mechanism and prevent painful episodes. Osteopaths are skilled at finding the mechanical reasons responsible for abnormal loading of your facet joints as well as identifying abnormally stiff and tight muscles. They use effective, gentle treatments to correct these stresses and relax tight painful muscles. However, it does take some time and often requires between 4-6 treatments to get rid of the pain – and longer to allow the strain to be kept away from the worn facets. But it is perfectly possible to allow the spine to work more efficiently and to reduce the abnormal loading of the worn facet joints, thus stopping any acute flair ups. Medication prescribed by your GP can often help with the acute pain, but can have quite nasty side effects and can be addictive. Also, medication only addresses your symptoms and will do nothing about the underlying injury process, meaning that there is a risk of this recurring again, if not managed with appropriate treatment and advice. If your symptoms have persisted for longer than 3-6 months it is unlikely that osteopathy will be able to help, especially if you have already tried this or some other form of manual therapy. Surgery is not usually advised for this condition. Your GP will probably refer you for a steroid injection for which you may have to wait quite a long time. In addition, steroid injections do not address the underlying condition but just bathe the joint with a strong anti-inflammatory to help with the pain. The pain often returns, but if it stays away for 3 months it is less likely to. However, the underlying problem still remains and without some form of rehabilitation there is a large risk of recurrence. For cases such as these we would recommend that you consider IDD Therapy spinal decompression with which we have successfully treated many hundreds of patients.